The Puy de Dôme is the department most famous for its heritage, thermal stations and gastronomy where local residents still consider themselves Auvergnats. 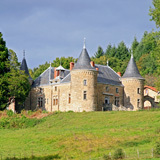 Its architectural heritage is remarkably well preserved and there are some delightful towns, villages, Renaissance chateaux, major churches representing the Auvergne's Romanesque art (Orcival, Saint-Nectaire, Issoire, Notre-Dame-du-Port in Clermont-Ferrand and Saint-Saturnin) and thermal spa resorts (Le Mont Dore, La Bourboule, Royat or Châtel-Guyon) and mineral water sources (Volvic and Rozana) to be discovered. The Puy de Dôme is the other wine growing area of the Auvergne which has generally been considered France's lost wine region but which is slowly gaining recognition. The Cotes d'Auvergne appelation is exclusively for wines produced in the Puy de Dôme. The major towns are Clermont Ferrand, Ambert, Issoire, Riom and Thiers. 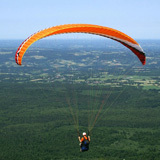 The lakes, rivers, valleys, and volcanoes of the Chaîne des Puys range offer a multitude of activities. Take advantage of the many things to do and the diverse landscapes of the Puy-de-Dôme for outings as a family in the fresh air, including cycling, skiing, horseback riding, paragliding, canoeing-kayaking, swimming, hot air balloon flights, snowshoeing, and more. The Puy-de-Dôme is a paradise for hikers and outdoor enthusiastsis, having more than 5,000 km (3,100 miles) of posted trails, many of them specially designed for families. 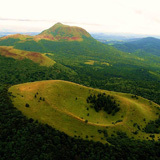 Be sure to visit the Puy de Dôme volcano for a view of the Chaîne des Puys and the Sancy Mountains. The Parc des Volcans is a popular year round tourist destination as is the region of Super-Besse located on the southern slopes of the Puy de Sancy, which offers a range of season- adapted activities for the whole family. Visits to the thermal spa towns and resorts of Le Mont Dore, La Bourboule, Royat and Châtel-Guyon are a must, as is bathing in their healing waters. For more information visit our Bien Etre page and click on the links to these towns.